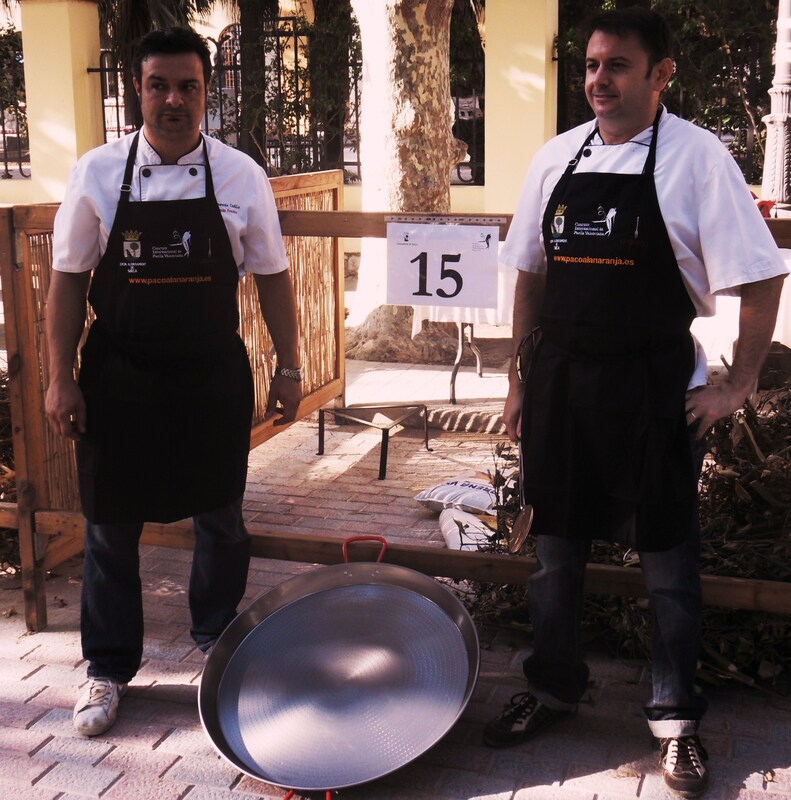 52nd International Paella Competition, Sueca 2012. This is THE Paella event of the year! Sueca is the spiritual home of the paella, centre of the rice-growing district and each year hosts the International competition to declare the best paella chef of the year. Thirty professionals, from accredited restaurants are selected to cook. Any restauranter in the world can apply, but only 30 will be selected and this year saw invitations to Las Vegas, New Zealand and France as well as restaurants from Cordoba, Seville, Madrid, Jaen, in wider Spain. The remainder were local restaurants from Murcia and within the Valencian Community. There is no getting away from it…competition is intense but remarkably friendly, all the chefs and their teams exchange jokes and banter before it starts but once it has the only interchange is a sneaky glance at how your neighbour is doing during the two hours allowed for cooking. The rules are very tightly written, the ingredients, pans, wood, triangle supports and water are all supplied by the town hall in order to ensure a level playing field. 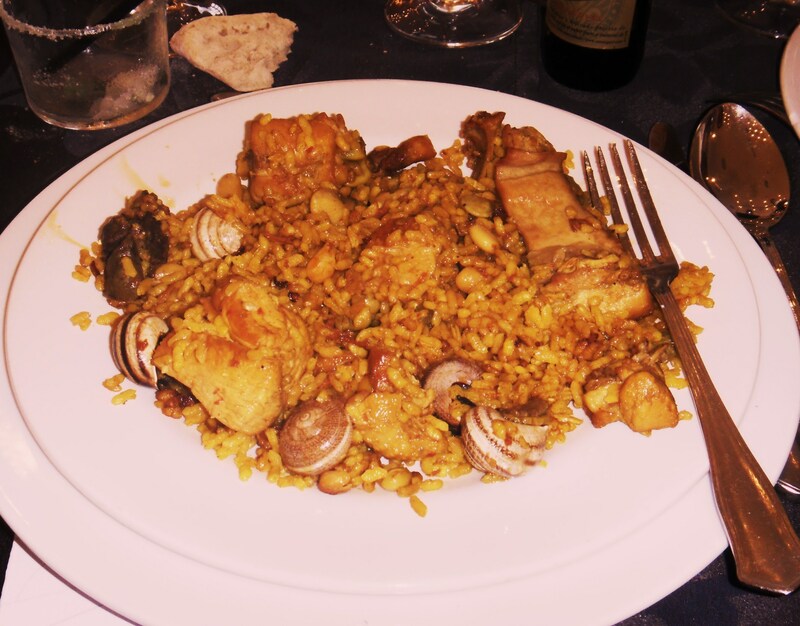 Rice from Sueca, Free range chicken, rabbit, snails, garrofó, tavella and ferradura ( the three beans) olive oil, garlic, tomato, pimentón, saffron and a sprig of rosemary ( which is optional). 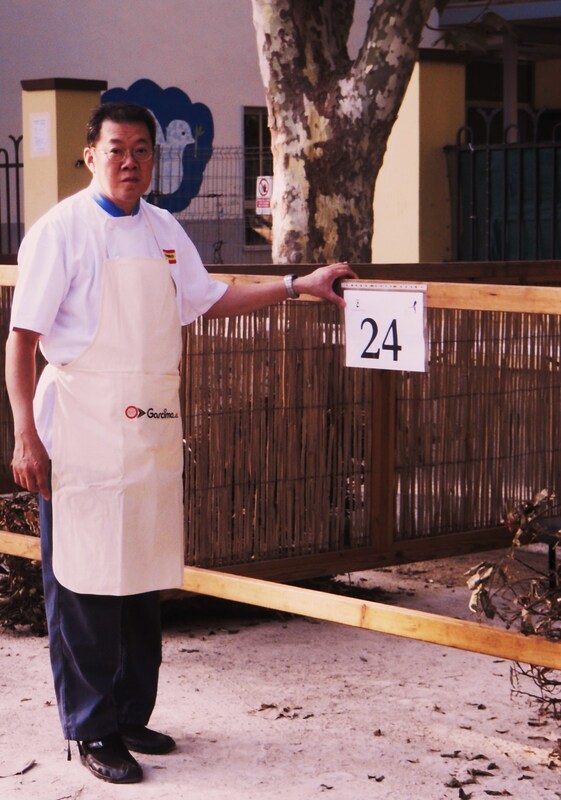 The town hall thoughtfully set aside the park opposite Sueca Station and fence off thirty corrals for the chefs to cook in. 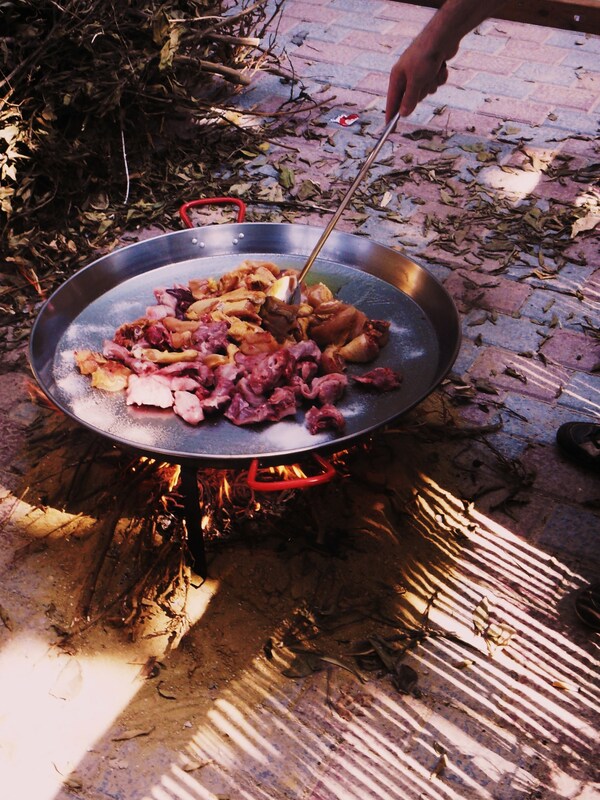 Even the method of cooking and the order the ingredients are added to the paella pan are prescribed. 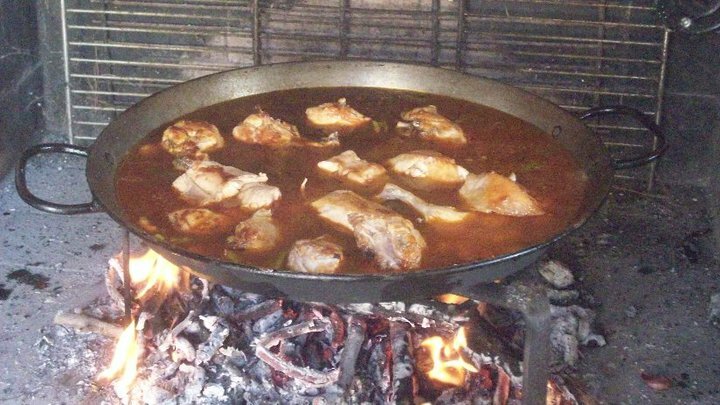 Essentially the aim is to cook as slowly as possible to brown the meat and create a caramel in the bottom of the pan which forms the basis of the `socorrat´, the most prized element of the paella which essentially is the burn´t bit on the bottom! Then with around 25 minutes to go the fire is stoked up, the liquor brought to a rolling boil and the rice and snails added. 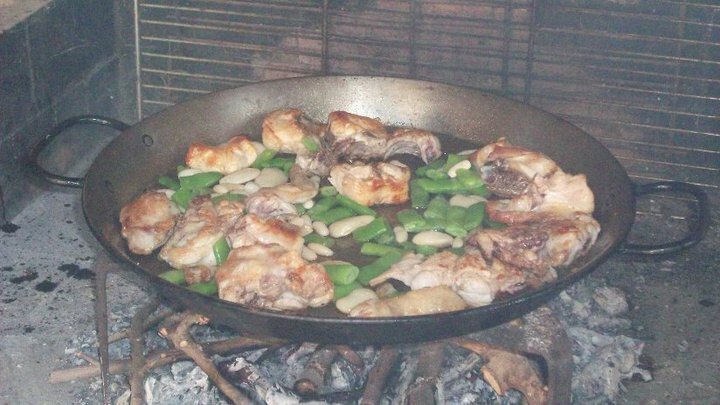 After 15 minutes the heat is reduced and after it reaches the point where it is cooked, the paella pan is lifted off the supporting triangle and sat on the ashes to `reposar´or relax, as well as fixing the socorrat. Then the chefs take their paellas to be judged by the Jury and the teams, their guests, the dignitaries and other lucky visitors go off to the local banqueting suite for a very good lunch, courtesy of the Town Hall and the sponsors! This year I found myself amongst the fortunate guests! How so? 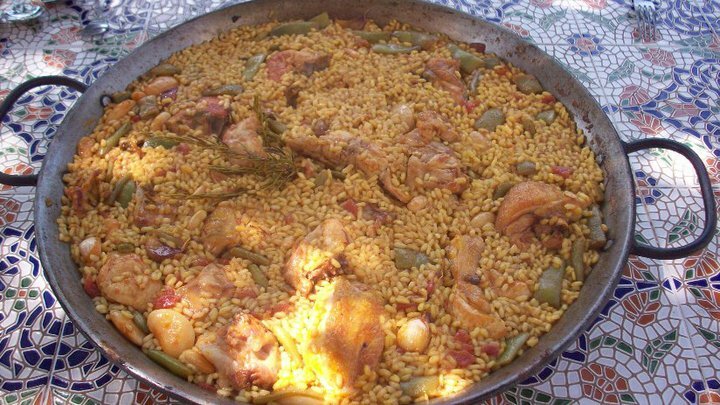 Well, the Plataforma Información Gastronomica, dedicated defenders of Valencian gastronomy in general and defenders of paella in particular had entered local restauranter Eduardo Frechina of El Castillo, Godella and invitation had fallen through his letter box. Supportes of PIG eat Almuerzo. Not surprisingly therefore his `equipe´ consisted of at least 11 supporters who arrived in Sueca for almuerzo, bread, ventresca provided by Maestro Galbis from nearby L´Alcúdia and a rabbit dish cooked previously by Eduardo taken with bread and washed down with Cava and Syrah from Daniel Belda. Suitably fortified, attention turned to preparation, the beans podded and chopped, the chicken and rabbit cut to appropriate chunks, the tomatos grated, the garlic peeled and the rice and water collected from the organisers. Then the orange branches were broken up ready to add to the fire as needed, the sand laid out on the floor and the triangular support steadied and levelled with the appropriate pebble. All of this was done meticulously, with great attention to detail and much additional tradition ( eg the jugs of San Miguel to keep the team fresh) under a growing sun! The start was announced but curiously no-one lit their fires for a while! Smart phones were deployed to time the different stages! Eventually the fires were lit the pans deployed, oiled and salted and the meat began to cook. As the stages unfolded the crowd gathered at various stalls, the TV crews ( at least five) interrupted proceedings with interminable interviews and famous chefs who were not invited this year chatted to their competing colleagues, offering unwanted advice! The previous years winner is automatically excluded from the competition and participants from the previous year may only compete if there are insufficient new applicants. Acrid smoke wafted through the trees, the heat increased….and not just the heat of competition! Gradually we reached the stage where the rice was added, the air now white with smoke, the San Miguel flowed faster. Then suddenly it was all over, the paellas were being carried to the judges leaving the teams to clear up after their respective chefs and enjoy the odd bottle of cava which had been lurking in the bottom of the cold boxes. We joined the procession to SalaCancela where the lunch was being held . Five courses were to follow, a tartlet of seafood with wild mushroom, Valencian Salad, a cannelloni of Confit of Albufera duck, a palate cleanser of mojito, a main course consisting of paella, the thirty competition entries shared out amongst the 250 guests, then a chocolate ice cream bombe, coffees and brandy. Wines were provided by 40ºNorte, a Merseguera/Sauvingnon Blanc blend called Mar de sao and a young Syrah, So de Syrah, a top new bodega from Alforins. 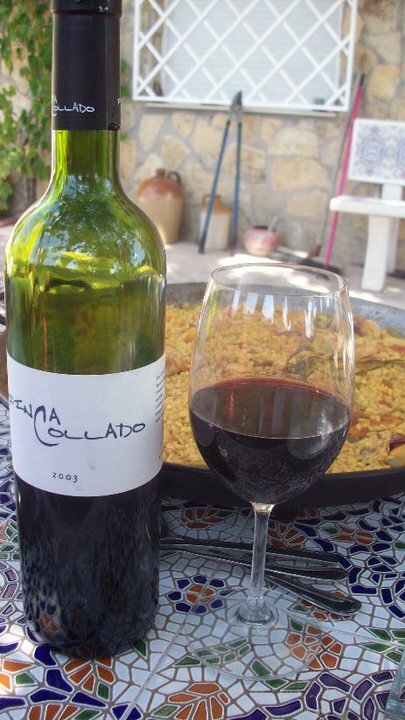 Cava was provided by Bodega Pago de Tharsys, the Brut Nature Carlota Suria being the perfect accompaniment to paella. 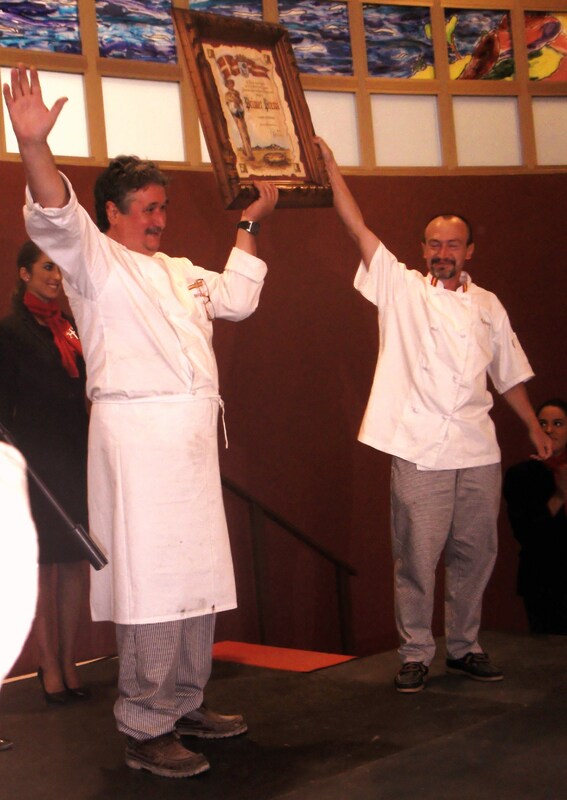 The prizes were handed out, the eventual winner being declared as Restaurant Ba-Ba-Reeba from Las Vegas, USA. But it was alright, those pesky Americans hadn´t really won at all as the Chefs were Valencians who live there! For the record, our team of Eduardo Frechina and Alfonso Martinez Serrano came ninth out of 30, just outside the awards, but rewarded by the experience of cooking with the best….make no bones about it Michelin starred chefs such as Oscar Torrijos were taking part as well and there are no losers as participation in the occasion is sufficient! PIGs can hold their heads high and plan victory for next year! The Winners! Ba-Ba-Reeba, Las Vegas.